TEL AVIV (Sputnik) - The Israeli Defense Forces (IDF) launched on Wednesday attacks on the targets of Palestinian militants in response to rockets strikes from the Gaza Strip. Earlier, the Israel Defense Forces (IDF) reported that Palestinian militants fired on Wednesday eight rockets at the Israeli territory, with two of them having been intercepted by the Israeli Iron Dome aerial defense system. "Following the previous report regarding sirens heard in the city of Sderot and the Sha'ar HaNegev Regional Council, eight projectile launches were identified from Gaza at Israel. The Iron Dome aerial defense system intercepted two of the launches," the IDF spokesperson wrote on Twitter. Prior to that, the Israel Defense Forces stated that Palestinian militants opened fire at Israeli civilians engaged in the construction of a barrier along the security fence near the Gaza Strip. "A short while ago, terrorists fired shots at civilians engaged in the construction of the barrier along the security fence near the northern Gaza Strip," the IDF spokesperson wrote on Twitter. The IDF did not report about any casualties caused by the incident. The Twitter post also included four photos of a vehicle damaged by bullets. Shortly after, the IDF reported they have targeted a Hamas post. 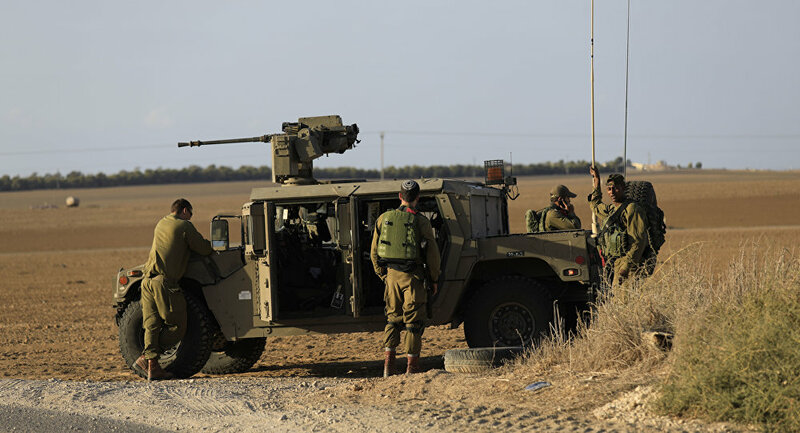 Earlier today, terrorists fired shots at an engineering vehicle near the northern Gaza Strip. In response, an IDF tank targeted a Hamas post in the northern Gaza Strip. Later, the IDF posted a video of the Israeli the city of Sderot after the fire from the Gaza. Israel has repeatedly called Hamas responsible for any attack on Israel carried out from the Gaza territory. Palestinians seek diplomatic recognition for their state on the territories of the West Bank, including East Jerusalem, which is partially occupied by Israel, along with the Gaza Strip. The Israeli government refuses to recognize Palestine as an independent political and diplomatic entity and continues to build settlements in the occupied areas despite objections from the United Nations.